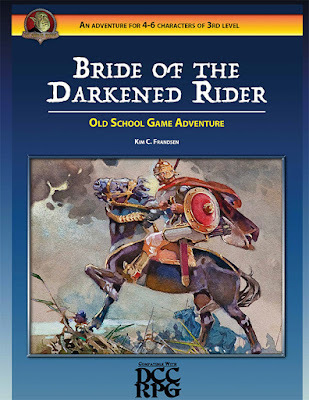 Bride of the Darkened Rider is a 3rd level adventure by Kim C. Frandsen. Rick Hershey is listed as an artist on RPG Now, but the illustrations appear to be public domain images. 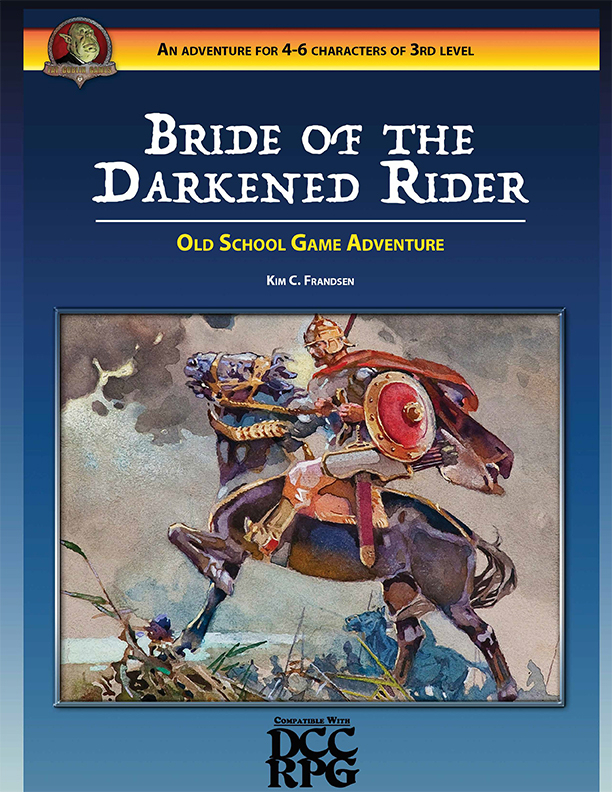 Bride of the Darkened Rider is published by Fat Goblin Games. Disclosure: I was given a chance to write for this imprint, which I had to decline because the offer conflicted with other writing commitments. Right upfront, this adventure piqued my interest with an appropriate quote by the estimable Robert E. Howard. On top of which, the public domain illustrations come from collections of fairy tales and legends, as far as I can tell, making this adventure easy to slot into the world of Faerie Tales from Unlit Shores. That was, in fact, one of the reasons that I declined the offer, as I feel rather honor-bound to send further fairy tale-inspired manuscripts to Purple Duck Games until the FT Series is complete. The author does a good job making use of fairy tale elements, and does an excellent job of using the "death throes" advice in the Dungeon Crawl Classics core rulebook to make opponents have a final surprise. There are a number of pieces in the adventure that are quite flavorful. The author also includes a number of vignettes which demonstrate something of day-to-day life in the adventure setting. The monsters encountered are flavorful, and definitely hit the "make monsters mysterious" mark. Writing to make the work fit pre-existing art is rather like writing sonnets when compared to writing free verse. I think that Kim Frandsen did a good job of linking art to words, so that the art actually compliments the adventure. I should also mention that this adventure includes a complete new patron, Morketh, Lord of Darkness and Unspoken Pleasures. Morketh does not have patron spells, but rather grants an extra spell slot when client wizards can gain 1st, 2nd, and 3rd level spells. For all that, there are some problems with this product, and you should be aware of them before purchasing. First off, this is a really medieval adventure that uses some jarring modern parlance. Par for the course with a lot of adventures, I know, but when a dryad suggests "We better go up and check it out" or a minstrel doesn't know where the dark knight "originally worked", it jars with the tone of the rest of the adventure. Secondly, the adventure really, really needed another editing pass. Minor glitches abound, but there are places where a lack of editing drops parts of sentences or makes it more difficult than necessary to understand what the author intended. At one point, your PCs enter a combat encounter with three individuals, only one of whom has a statblock (p. 19). The editing also damages the utility of the unique patron, as his first spellburn entry is incomplete. There is a poison that does more damage to you if you succeed than if you fail; I imagine that the damage on a failure is intended to be permanent, while the other is temporary? Third, I am not sure how much Dungeon Crawl Classics the author has played, but the spellburn table for Morketh, while flavorful, will need some work to match the framework of spellburn in the DCC rules. Similarly, while most examples of patron taint in the core rules (or other sources) have three levels of most taints, so that if rolled again, the effects become more severe, the client wizard of Morketh gets off somewhat easily. I would also imagine that more play experience would have increased the difficulty of the fights for 3rd level adventurers considerably. I would be happy to throw this adventure, as written, at 1st level adventurers. Against 3rd level PCs, you may wish to beef up the opposition. Finally, although the first half of the adventure as written is very linear, I imagine that as played, the linear parts will go by quickly enough not to bother the majority of players. Some of the linear material could have used more detail - for instance, what if you refuse to help the dryad? What boons can the old wizard on page 17 give PCs who befriend him (i.e., who are looking to learn spells)? What if they decide to kill him and take his stuff? What is his name? Is there any benefit to becoming the dryad's lover? I ask these questions because I know that they are the kinds of questions that players ask, either directly or indirectly through their actions at the table. Because this is currently pdf-only, a lot of these issues could be cleaned up before (hopefully) a print version appears. There is more than enough good stuff here that I am glad that I bought it, but if the aforementioned problems were addressed it could be stellar. EDIT: Many problems were fixed prior to print, but the cut-off table in the patron listing is sadly still there. Here's hoping for a long and prosperous product line! If I'd known you'd be reviewing it, I'd have gotten you a review copy. I'll try to keep you in mind should any more DCC be released, but otherwise, please just remind me so I can look into it for you. Before I start I should note that I normally would leave reviews well alone. It feels like I'm trying to defend my own creation and reviews should be allowed to stand on their own. Regardless of whether I think they're fair (like in your case) or not, it is the experience of the player/judge/reader and they have the right to their opinion. The choice of mixing modern day language and the medieval setting was actual a concious one on my part. English is not my first language, but I'd like to think I'm fluent in it (in fact, my wife is English herself), but one thing I have noted is that when you're playing with non-english speakers you vary your language a lot, as in the "read-aloud" text comes out in English, but your actual gameplay is in your native language. That leads to a fair bit of confusion at any gametable, but the biggest problem really is the technical or historical jargon/language. Playing in a group where not everyone is fluent in english gives a lot of moments of "what does that mean?" - Hopefully mixing the language eliminates that, but I can certainly understand why it's jarring. The old man's name is Terrick (it's one of the first things the Dryad says to him, though it is quite well hidden). There is no boon to working with him (he even explains how his powers were stolen, though that could be expanded upon after the death of the villain). It doesn't seem like a rant at all. The document does need another editing pass, and a serious one at that. The statblock was the biggest glitch, but there are others you might want to have looked at. If English is not your first language, you did very well indeed! There's no need to offer review copies; this blog will eventually contain some discussion of every DCC product, as near to alphabetical order as I can manage. It is a joy to provide this to the DCC community. I am jammed solid trying to get things done in time for GaryCon, or I would offer to do a full editing pass now, but I would be willing to help you drum up playtesters in the future, or give things a look-over. Excellent. Glad to do it.